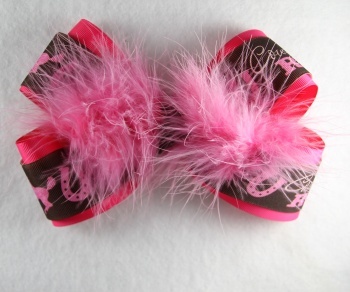 Cowgirls and Feathers all wrapped up in one great bow. This is a double layered bow of a 2.25" hot pink on the bottom, a 1.5" brown in the middle and topped off with a pink feather. The Cowgirl themed brown bow has pictures of a Cowgirl riding on a horse, white horse shoes, and the words "Cowgirl's Rule". The center is wrapped with the same brown ribbon.